The 2018 East Coast Games start on June 22nd and the organizing committee is pleased to announce that Debbie Cooper and John Doyle have been selected as Honorary Chairs for the 2018 Games. 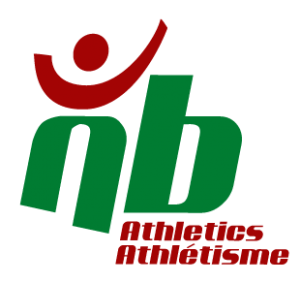 Both Debbie and John have been very active in the New Brunswick athletics community throughout the course of their careers. With a diverse history that includes participating in 9 Canadian National Fast Pitch Championships along with a second-place performance at the NB Scott’s Tournament of Hearts, Debbie Cooper has committed more than five decades to being an athlete, coach and leader in the Saint John sports community. Apart from being a curler, softball, hockey, volleyball and basketball player, she’s also taken on many administrative and leadership positions with countless local sport associations. 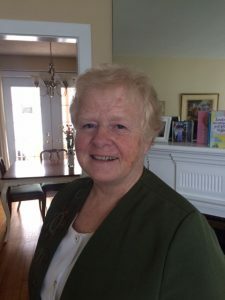 Debbie was an Organizer and Past-President of the Saint John Women’s Volleyball League as well as having been a Co-Founder of the Saint John Women’s Hockey League. John Doyle’s dedication to athletics has been felt as player, coach and manager. His interest in the sport of basketball started at the YMCA and the Rotary Boys and Girls Club and culminated in his being a member of the Assumption Canadian Juvenile Championship Boys’ Basketball Team. He later was a great supporter and fan of his son Greg’s high school and university basketball teams. John and his late friend, Rip Seeley, were named “Honorary Saints” for their support of St. Malachy’s basketball program. John was also awarded the Honorary #1 Fan Award from UNBSJ’s Men’s & Women’s Basketball Teams in 2005. More recently John has become a familiar face at the Saint John Sea Dogs and Rip Tide games. Both of this year’s Honorary Chairs are well rounded having not only been athletes but having been active in the broader community. Among other awards, Debbie has been honored with a Duke of Edinburgh Award, the Queen Elizabeth II Diamond Jubilee Award as well as being inducted into the Softball NB Sports Hall of Fame. 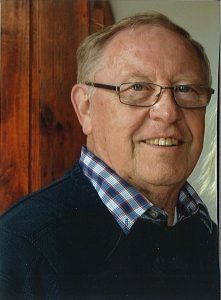 John on the other hand has been the recipient of the Mel Osborne Award for Outstanding Contribution & the 2012-2013 Human & Spiritual Value Award from the Kiwanis Club of Saint John, along with the Canada 125 Award, the Queen’s Golden Jubilee Medal along with a host of other recognitions. “Part of the East Coast Games mission is to celebrate the spirit of sport in Greater Saint John. The committee is very proud to have these two talented individuals as our honorary chairs for 2018,” said co-chair Keith Raynes. Saint John, NB February 15, 2018 – The East Coast Games, Atlantic Canada’s largest annual multi-sport games, are happening in Saint John for a 4th consecutive year from June 22- 24, 2018. Last year’s games saw record participation at over 2100 competitors and the 2018 Games are set to grow again. The Organizing Committee is expecting the three-day event to include 20 different sporting events attracting nearly 2500 athletes. Over the past three summers, almost 5000 athletes have descended on the fields and athletic centres around Saint John as a result of the East Coast Games and in 2018, the impact is growing. The Organizing Committee is planning for the summer and posting new information to their website as tournament details become available with schedules to be released in the coming months. Be sure to mark your calendars for June 22-24, 2018 to see some exciting sporting events and talented athletes. 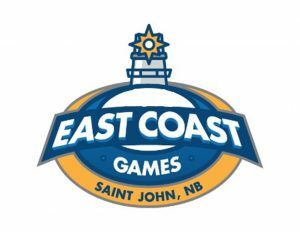 For more information, please visit our website www.eastcoastgames.ca. Follow us on Facebook for the up to date schedule changes! Sain t John, NB – This year is an exciting year at the track as the East Coast Games collides with the Canada Games Selection Trials. New Brunswick’s best athletes, under the age of 23, will be in the city vying for spots to represent their province in the 2017 Canada Games, taking place in Winnipeg in July and August of this year. The track & field team being one of the last teams selected for Canada Games. As it is an individual event, the track & field team is selected to give athlete’s an opportunity to demonstrate competitive readiness as close to the event as possible and ensure the best athletes are named. 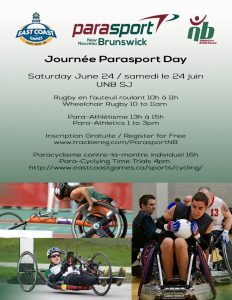 The trials will include NB’s top young track athletes including. The track & field events have been scheduled to fit around Rugby 7’s which are also being held at Canada Games Stadium over the weekend. In addition, the Ultimate Frisbee tournament will host an exhibition match on Friday eventing while track events are taking place. This will result in a busy venue at UNBSJ with lots of excitement for spectators and athletes alike. Join us for the East Coast Games Coaching Symposium because we know how valuable a great coach can be. This year, Darren Steeves a professional Exercise Physiologist/Strength Coach will be joining us as our Keynote Speaker. champion Mark de Jonge as a case study. Darren has worked in the high performance sport field for over 20 years leading Dalhousie University’s sport science program for 10 years and with Canoe Kayak national team for the last seven. He has consulted with over 20 different sports, Olympic Medalists, World Champion athletes and attended the most recent Rio games as a sport scientist with Team Canada. Darren heads the Research Action team for the Canadian Sport Centre Atlantic, is an adjunct professor with the School of Health and Human Performance at Dal and is currently in a the middle of a major CORE study funded by Own the Podium. Darren has lectured to thousands on sport science, fitness, health, wellness and has released his first book in 2017 titled “Are you ready? These sessions are an excellent way to brush up on your skills and earn NCCP Professional Development points. The 2017 East Coast Games start on June 23rd and the organizing committee is pleased to announce that Mrs. Mary Ann Patterson and Mr. Malcolm (Mac) Smith have been selected as honorary chairs for the 2017 games. Both Mary Ann and Malcolm have been very active in the New Brunswick volleyball community, throughout the course of their careers. Mac grew up in Sackville, NB and has played many sports throughout his life including baseball, volleyball and hockey. Mac played with the Fairweather Royals in Saint John. They won the Maritime Intermediate AA Fastball Championship in 1979. He coached the Saint John High Hockey Team before he was hired at that school, where he went on to teach biology, history, physical education and co-op education. He retired in 2001, after 28 years. He coached both the girls’ and boys’ varsity volleyball teams. One of his favourite coaching memories is from 1983, when both of his teams won the Provincial Championships. Mac has stayed involved in the sports community, since his retirement, as an off-ice official for both the Saint John Flames and the Saint John Sea Dogs. He says sports were never just about winning (although that was nice!) but rather about the sense of community sports created for him and his teams. He looks forward to being involved with the 2017 East Coast Games. Mary Ann grew up in Fredericton, New Brunswick. She describes herself as always being athletic but she was never enrolled in organized sports as a child. “Girls couldn’t go over half when I was playing,” she recalls about playing basketball. Mary Ann certainly helped change that throughout her career, coaching many young women, taking several teams to national competitions. Mary Ann worked at many different elementary schools in the city, helping to develop a better physical education program and retired in 2006. Volleyball was, and remains, Mary Ann’s favourite sport and passion project. Mary Ann and her husband, Dave, took teams to Women’s Nationals on several occasions. They were inducted into the Saint John Sports Hall of Fame in 2010 for their contributions to the sport. Mary Ann’s favourite sports memory is of coaching the Women’s Volleyball team at the 1983 Canada Games in Saguenay-Lac St Jean, QC. She was manager for the team that year and coached with Dave by her side. She is looking forward to being an Honorary Chair for the 2017 East Coast Games. The East Coast Games are back for their 3rd year in 2017 with 12 sports involved! Saint John, NB – The East Coast Games, Atlantic Canada’s largest annual multi-sport games, are back in Saint John for a 3rd consecutive year. The 2017 Games will see nearly 1,800 athletes participating in more than 12 sports including rugby, basketball, softball, ultimate Frisbee, track & field and more. “We’re excited with how the Games have grown and how in just 3 years, we’ve doubled in size. We’re on track to sustain, if not continue to grow participation in 2017 through the expansion of existing tournaments as well as the addition of new sports like baseball, karate, Cross-Fit and a triathlon,” says Event Co-Chair, Keith Raynes. “We are also thrilled to continue our partnership with our Presenting Sponsor, Emera New Brunswick. Their support has been invaluable to us in the development of these Games,” adds Raynes. The committee has launched a new website to better promote the games further updates available there on a regular basis. 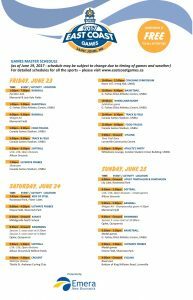 The Games schedules will be released in the coming months but be sure to mark your calendars for June 23-25, 2017 to see some exciting sporting events and talented athletes.